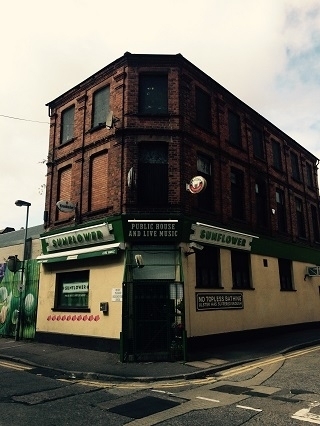 Opened in December 2012 the Sunflower Public House is a hub of live music in Belfast city centre. Located behind Belfast Central Library it is a 5 minute stroll from the heart of the Cathedral Quarter and a stone's throw from the Hudson Bar and Kremlin Nightclub. A quirky pub that a tourist or visitor looking for an alternative watering hole will appreciate. Have you got Google Earth on your computer? If so, then download the Google Earth view of The Sunflower Pub. Is this the wrong position for The Sunflower Pub? If you think so, then modify its position. Click / Tap the button above to get directions from where you are to The Sunflower Pub. Awful beer served in plastic glasses - awful service. In the pub on Saturday 17th March. First drink of the day -pint of pale ale - tasted horrible - asked the barman for something else as a replacement - he took the pint from me, tasted it, said it was ok and handed it back to me! Left the pint on the bar and left the bar never to return! Off the beaten track. Well worth a visit ! I hope it doesn't get knocked down!